To encourage the preservation of craft, buildings and sites of historical or local interest. To seek to preserve artefacts and records associated with this history. To retain and encourage the skills associated with all aspects of building, repairing, handling and the use of craft. Our activities centre around the Milford Haven Waterway in west Wales, where we have workshops on the historic site in Pembroke Dock, known locally as Hancocks Yard. Ships have been built here since 1804. 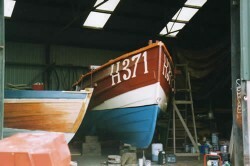 We have a number of restored vintage sailing craft and there are several still to be restored. There are plans for building a Tenby Lugger - the boat depicted in our logo. When we are not working on the boats at , we are out sailing these craft and endeavouring to engage the interest of the general public and keeping this part of our great heritage alive. We organise sailing events, social evenings, lectures, open days and we take part in as many events as possible. Our members are all volunteers and anyone is welcome to join in. Skills associated with the work can be acquired on the job so there are no qualifications needed. The work of the Society is carried out wherever possible by volunteers in our Pembroke Dock workshop. Some tasks, of course, need the expertise of expensive professionals. Working parties are held on a regular basis at Pembroke Dock on Mondays from 10 am and at other times by arrangement. In the interests of safety, it is desirable that more than one member is present at any time. Research, creating records, fund raising and furthering projects, involving correspondence, administration, accounting, drawing or other specialised work are often performed by members at home. The library which is temporarily housed in Haverfordwest Public Library and comprises over 700 maritime books; ranging from technical to fiction and a large number of nautical charts. These are available to all members for research on the premises, or, in the case of books, to borrow. The Society welcomes offers to donate artifacts, including books and charts. A growing collection of photographs needs filing on computer disc and display copies are required. A limited research service is available to members and non-members. This could be expanded, given additional research volunteers. Any special talents or skills will be welcome - there is usually a need for photography, audio or video recording, draughtsmanship, administration, fund raising, event organising etc. and lots of semi-skilled or non-skilled help can be useful too. Enthusiastic members to talk to the public and 'steward' our displays are always needed. Don't hesitate.